Toners are important in the skin care regime because they remove excess oil and traces of dirt and grime remaining on skin after cleansing. Furthermore, they help restore the pH balance of your skin, tighten the pores, and stimulate blood circulation. You can make your own skin toner at home by combining various natural ingredients from your kitchen. Thus, unlike commercially available tones, they do not contain harmful chemicals. In addition, these toners are inexpensive and convenient to make. Moreover, you can add different essential oils, floral hydrosols, fruit and vegetable juice, etc. in natural skin toners to make them suitable for a variety of purposes such as acne, wrinkles, dark spots, and so on. • Using a solution of three parts water and one part apple cider vinegar works as a great skin toner for all skin types. Those who have dry skin can dilute the vinegar more. Besides, plain water can be replaced with green tea to enhance the beauty benefits of this toner. You can use this simple yet effective toner one or two times in a day. Alternatively, mix a teaspoon of organic apple cider vinegar in one and a half cup of water. • Another easy way to make a facial toner is to add a teaspoon of baking soda in a cup of water and apply it on your face up to two times in a day. It is particularly good for getting rid of acne. • Whisk an egg white along with one teaspoon each of lemon juice and honey. Leave this recipe on your skin for almost 10 minutes and then rinse this skin toner off to tighten the pores and reduce wrinkles. • Put one cup each of fresh, chopped cucumber, chopped tomato, lettuce leaves, and four tablespoons of lemon juice through a juicer. You may also puree these ingredients in a blender and then extract the juice. Apply this juice on your face and neck as a natural toner to reduce blemishes and lighten your skin color. • A combination of two teaspoons each of watermelon juice, distilled water, and one teaspoon of vodka can be used as a natural toner for skin. • Prepare a toner for dry, mature, sensitive skin with anti-aging properties by combining one cup of rose water, three drops each of sandalwood, lavender, Frankincense essential oils, and a drop of chamomile essential oil. You may add a teaspoon of vegetable glycerin, too. • Facial toner for dry, sensitive, sunburned skin can be made by heating two-third cup of milk mixed with one tablespoon each of dried lavender and lemon balm. Allow it to cool. Finally, strain it with the help of cheesecloth and apply the solution on your skin. Here’s a video showing how to make a rose water and toner. • When dealing with oily and acne-prone skin, make a homemade skin toner by adding three drops each of lemongrass, palmarosa, petitgrain, tea tree essential oils, and a drop of rose geranium essential oil in a cup of witch hazel. • Another toner for oily skin can be prepared with white wine as the base. For this, you need to simmer a cup of white wine in a pan and add one teaspoon each of fresh chopped mint leaves, dried rosemary and dried thyme in it. Next, leave the mixture for about an hour. Finally, strain the liquid and use it as a skin toner. • In case of normal to sensitive skin, take 100 ml chamomile infusion or chamomile tea and add a drop of German chamomile oil in it. Keep the solution aside for about 36 hours. Finally, strain the fluid through a paper coffee filter. Apply the resultant liquid as a homemade skin toner. • Blend a small cucumber and half a cup of plain yogurt, and use this skin care recipe as a facial toner for normal skin. • Steep a tablespoon of mint leaves in a cup of boiling water for a few minutes. Allow it to cool and then strain the liquid. Next, put four tablespoons of cucumber juice and two tablespoons of carrot juice in it. Plus, mix freshly squeezed lemon juice in this beauty recipe. You can either apply it directly, or pour the solution in an ice tray, let it freeze, and then rub the ice cubes on your face and neck. • A combination of two tablespoons of fresh lemon juice and a tablespoon of rose water works as a good toner for your skin. 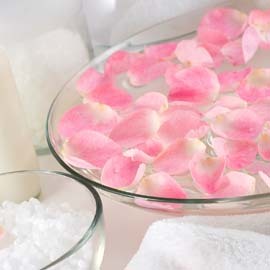 Another simple toner can be prepared by mixing half a cup of rose water and a quarter cup of witch hazel. • Another toner for tightening the skin and healing dark spots can be prepared by mixing three tablespoons of tomato juice and a teaspoon of organic honey. Similarly, you can apply a combination of cucumber juice and honey, or cucumber juice and green tea. • Puree the pieces of a ripe papaya in a blender or food processor and mix four tablespoons of apple cider vinegar in it and use it as a toner. This recipe also helps exfoliate your skin and works wonders on freckles, age spots, etc. • Hydrate your skin by applying a mixture of two tablespoons of aloe vera gel and a teaspoon of lime juice as a facial toner. Home made toners are really good. I have tried it in past and It makes the skin very soft.